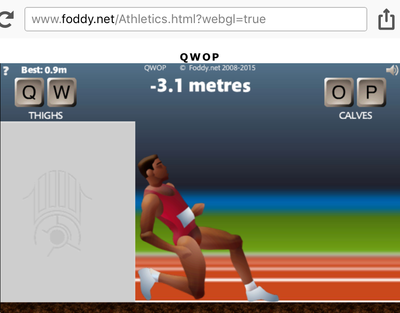 QWOP is a ragdoll-based browser video game created by Bennet Foddy. The game contains an eye sigil, making it part of the Eye Sigil ARG. The first Flash browser version was released on 12 Nov 2008, following iOS and Android apps on 21 December 2010 and 4 Jul 2013 respectively. The sigil was added in the WebGL web version that was released 4 Aug 2015. The sigil is drawn on a barrier that is located 3m backwards from the starting line. The piece is in the sky above the sigil (about two screens up). To see it you need to have a device with an accelerometer. Go backwards from the starting point to see the sigil and then turn your device upside down. The gravity will switch and you'll fly up to the piece in the sky. Note that due to the changes in accelerometer events on Chrome, it will not fire the required event unless you openned the page on HTTPS instead of HTTP. This shouldn't be a problem in iOS/Safari (confirmed on iPhone 4S). The piece is stored in the last bits of the red channel of assets/sky.png asset. This page was last edited on 1 March 2017, at 22:08.